We believe audiences deserve clear, rock-solid solutions to what’s keeping them awake at night. We believe thought leaders have a God-given responsibility to serve those audiences. We obsess about helping our clients create powerful experiences through remarkable content. We’re not a great fit for everyone, and we’re okay with that reality. We believe life is too short to work with jerks, so we don’t and we won’t. We work with thought leaders whose messages resonate with us well before and after we work together. The world is noisy enough as it is, so we fight to create every piece of content with a greater purpose. Our calling is to serve our clients, and subsequently their audiences, as we want to be served. This is the fight we refuse to surrender with Keynote Content. This is why we do what we do. Are you with us? Speakers, authors, and coaches are fighting more noise than ever to become a true influencer today. It seems like everyone and their mother's cousin is an 'expert' or 'guru' in a specific industry. If you're tired of navigating a clogged expertise, we're glad you're reading this. Confession time: we're a copywriting and content services firm for influencers moonlighting as a group that gives a care about making the world a better place. We're not looking for the dabblers or the weekenders. We're looking for those who are 'all in' with a story worth sharing that can change the world for good. So, how do you cut through the noise and stand out from the crowd? Welcome to the M3 Clarity Framework, our three-bucket, M-words approach to creating a context for crafting irresistible copy and remarkable content. And, we're more than a little excited about it. What ignites your passion, and why does it matter? Think about the last time you heard someone say, "The perfect way to whip this crowd into a frenzy is by reading my mission statement." Spoiler alert: that never happens. The world doesn't need more mission statements. It needs manifestos - those deep-in-your-bones, visceral beliefs stitched together by influencers who know that what they have to say has the power to change the world. At Keynote Content we believe true influence starts with having a passion so deep it's the ink of your Manifesto. Exhibit A: our Manifesto is at the top of the page because we won't recommend you go somewhere we're not willing to go ourselves. and how can it make their lives better? The reality is what you have to say isn't for everyone. That sound you hear is your sigh of relief. Your Market is your target audience, that laser-focused loyalist base that craves what you have to say. Your job is to create copy and content that absolutely resonates with their needs. What do they want to feel? What pain do they believe you can cure? What drives them to click on your website, buy your books, and register for your event? People don't buy products or services; they buy results with the belief that life can be better tomorrow than what it is today. Learn to love your Market because your Market wants to love you. ​and how does your Message help people? The world doesn't need another blog article... or a podcast... or a sales page... or any more content. What it needs is your content inside the context of your Market. We call that your Message - and it's where we spend the lion's share of our time and attention. Your Manifesto and your Market are crucial though; you need to know what drives your passion and who it's for, but it's your Message that keeps us fired up. 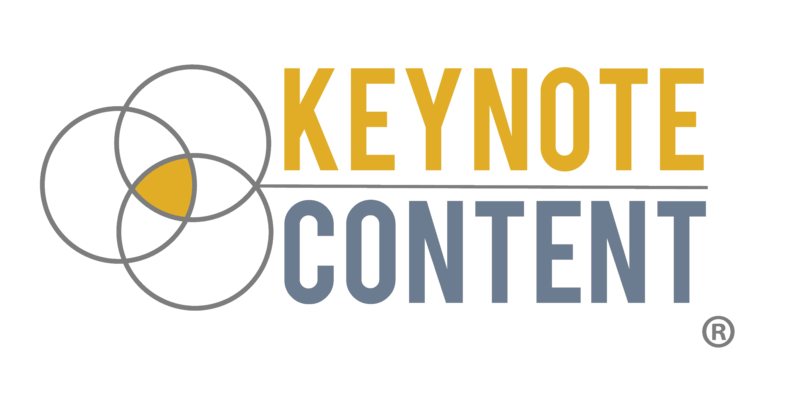 Our Keynote Content team, led by Jon Cook, works with bestselling authors, internationally recognized speakers, and seven-figure-plus coaches from around the world. We live, breathe, sleep, and crave writing irresistible sales copy and remarkable content to connect and engage with your audience. Your Message is our jam. We believe every piece of copy or content we create needs a greater purpose. Otherwise, we're just adding to the noise, and nobody truly benefits. Your Message is too important to get lost in the cacophony of marketing. Manifesto. Market. Message. Three words, one framework, all designed to give your audience a clear context to trust what you have to say. Everything we do fits into this framework. Everything. 1. Have you written a book or are you ready to write a book? 3. Do businesses trust you to provide some form of coaching or consulting? If you said YES! to any of those questions, that's a great sign! However, that's not a guarantee it's a good fit. We also have a list of principles shared through our Manifesto (again, at the top of the page) that protects our 'why' and our team. So, if you're a nice person with a message that can truly help others have a better life, we'd love to talk with you. Click the button below to start a conversation and let's do this!